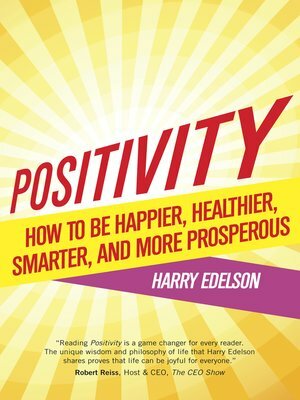 Harry Edelson is the son of an illiterate Russian immigrant whose husband left the family when Harry was an infant. He begins his book this way: "I grew up in the poorest neighborhoodin Brooklyn, which was the poorest neighborhood in New York City, and I was the poorest of the poor." But Mr. Edelson has no intention of wasting his life or our time by lamenting his childhood or anything else. He tells us, "I consider myself to be very lucky. I have been happy all my life even though I started out as poor as a child could be." . . . If you want to be happy, it is all in your mind. So take control of your senses, determine to be happy, and develop a frame of mind that will make you and all those around you happy." In Positivity: How to Be Happier, Healthier, Smarter, and More Prosperous Mr. Edelson reveals his secrets and tips for success from the vantage point of a person who has enjoyed having excellent health, a wide range of knowledge from a fine academic background enhanced by self-education, and fulfilling careers on Wall Street in technology, investment banking, and later as owner of a highly successful business in capital investments. Focusing on his strong belief in continuing education to increase skills that entertain us and help our careers, he extolls the benefits of being a speed-reader and increasing memory by learning the techniques of mnemonics, and he demonstrates interesting mathematical tricks that work for him.